Twitter revoked the verified status of Milo Yiannopoulos, a British journalist at Breitbart News, on Friday evening. He's gained over 7,000 followers since. Twitter's new crusade against violent speech was a hot topic this weekend. The company has gone after a popular -- albeit controversial -- Twitter user. It revoked the "verified" status of Milo Yiannopoulos, a British journalist at Breitbart News, on Friday evening. Yiannopoulos has over 140,000 Twitter followers and is known for his provocative, unapologetic commentary. He's been vocal in the contentious movement known as GamerGate, which claims to promote ethics in gaming journalism but has been condemned for its treatment of women. On Twitter, Yiannopoulos, who is gay, has taken aim at women. Like this tweet from December: "Is it any wonder successful gay men hate feminists, when women, in tax terms as elsewhere, are so ... well, parasitical?" On Friday evening, Yiannopoulos tweeted a screenshot of an email from Twitter stating that his verification had been revoked. "I've been sat at the naughty table!" he wrote. The screenshot, which Twitter told CNNMoney is valid, states that additional violations on his part could result in being removed from the platform all together. "I think this is the first step to getting me off the platform," he told CNNMoney on Sunday. "Ridicule and criticism are being re-branded abuse and harassment." Twitter (TWTR) announced on December 29 that it was taking new measures to combat posts that included "abusive behavior and hateful conduct." The platform has been criticized for allowing abuse, harassment and even death threats. 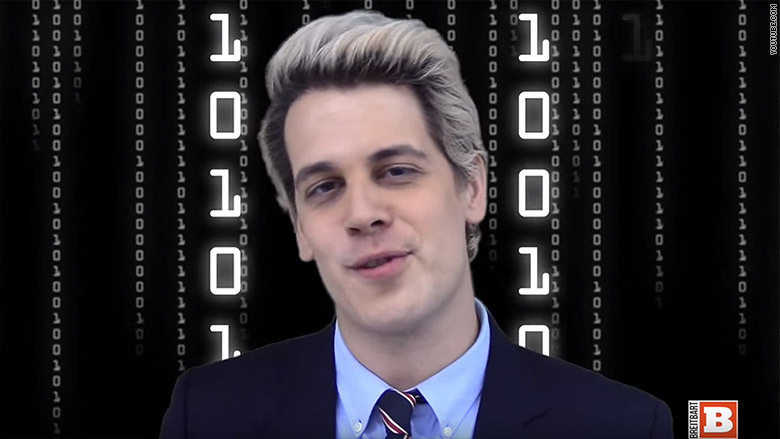 Yiannopoulos insists that his posts aren't serious. "They don't like the jokes I make so they're coming at me," he said, adding that he's unsure what specifically he said to offend Twitter. "I'm a provocateur, a satirist." Prominent Silicon Valley figures -- from Uber investor Jason Calacanis to venture capitalist Marc Andreessen -- have tweeted about Twitter policing Yiannopoulos and, subsequently, free speech. Others see it differently. One user referred to Yiannopoulos as a "known misogynist harasser." Game developer Brianna Wu tweeted, "Thanks @Twitter, for holding Milo accountable for harassment, being clear more will lead to permanent suspension." Yiannopoulos said he reached out to Twitter twice to understand what the company is reacting to. He received no response. Twitter told CNNMoney that it doesn't comment on individual user accounts but referred to its terms and conditions, which state an account may lose its verified status if it violates the company's rules or terms of service. "Twitter only wants to host one side of the discussion," Yiannopoulos said. "It's now become an ideological weapon to indicate the sort of person they want on the platform." It isn't the first time that a major tech firm has been criticized for introducing certain perimeters around speech on its platform. Yiannopoulos said he's gained over 7,000 new followers in the last 24 hours -- and a hashtag, #JeSuisMilo, which he said was trending in the U.S., Canada and the U.K. over the weekend. If Twitter is looking to set an example out of Yiannopoulos, it is also raising a lot of questions. "If it was clearly stated that you can't be polarizing on Twitter, then people would understand that. But right now, it's really unclear," said entrepreneur Elissa Shevinsky. Shevinksy suggests that Twitter publish more information about its verification policies so users will understand who gets verified and why. "He's one of many strong voices. I'd be concerned about singling him out uniquely," she added.